How people make payments is evolving. From signatures to chip and pin, from contactless to biometrics and today, payments made by wearables. In a digitally driven marketplace, businesses not only face the pressure of evolving technology, but the growing demands of consumers. And this pace of change isn’t slowing. The time between developments and enhancements is reducing. Flexible solutions that can quickly be enhanced, without disrupting the ability to transact is essential. It takes one innovative organisation to quickly disrupt the norm. Mobile commerce increased 38% in 2015 as customers embraced the ease and speed of making purchases in just a few clicks. People now expect every payment to be that simple, meaning businesses must find a way to keep their customers happy and their processes secure. At the same time, regulation is changing in response to consumer trends – for example applying more robust checks to protect digital transactions and more data orientated security through GDPR. Simple changes that enhance current practices can support a compliant, customer-centric strategy. In addition, developments to payments, such as the recently revised Bacs Direct Debit Scheme rules, simply reinforce security and authentication – responding to the trends of a digital society. In a fast-paced, consumer-led world, regulations and processes need to work better with each other. They need to be secure, dynamic and efficient. Where and how do businesses start? Understanding trends, and opportunities will be key. 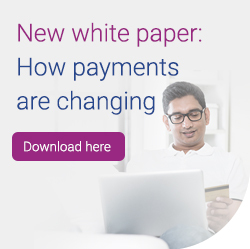 Our new white paper outlines some of the main points for consideration, alongside evolving trends, in the payments industry. From cheque book to smartwatch, new technology brings new payment options, new opportunities and new challenges. Today’s businesses need to deliver the fast, efficient services their customers have come to expect, while working to counter the risks of fraud. The UK makes £6 trillion worth of payments and 11 billion transactions every year[i]. The way payments are made is changing rapidly. The last decade has seen cheques become almost obsolete and mobile banking succeed online banking in popularity. Bills dropping onto the doormat have been replaced by Direct Debits, and even the once-revolutionary chip and pin feels dated following the introduction of contactless. New payment methods are faster and more efficient, requiring just a few clicks on a smartphone or a single touch through a phone app or watch. Customer experience can make or break a business. A good experience equals higher spend, repeat business and increased loyalty. On the other hand, every negative encounter can lose business and damage your reputation. Unfortunately, more people remember and relay a negative experience than a positive one. Why? Because they expect every interaction to be positive. Overlaid with this is the pressure to keep your business – and customers – protected from fraud. Fraud affects the entire electronic payments value chain, spreading rapidly across geographies and industries. It also increases costs, reduces revenue, damages reputations and impacts the customer experience. Financial fraud loss in the UK, through the use of payment cards, remote banking and cheques, increased by 26% in 2015 compared to 2014, totaling £755 million. Three quarters of this occurred through payment cards, with the main attacks being impersonation and deception, as well as malware and data breaches. This rise is partly due to the growth of personal data. The richness and breadth of data available on an individual makes it much easier for criminals to imitate genuine customers and obtain goods in their name. Hence the surge in account application fraud. Money transfers have also increased, supported by multi-channel transactions, with the levels of money being transferred capturing the attention of criminals. Although fraud is a problem for both card-present (CP) and card-not-present (CNP) transactions, online CNP payments carry the biggest risk. With the advent of PSD2, alongside a rise in the adoption of open APIs, card payments, as we know them today could be redundant. The challenge is to introduce measures that reduce fraud without disrupting the payment process. While customers have come to expect smooth, speedy transactions, they also want to be reassured that their data is safe and understand how it’s protected. Biometrics are set to become the next mainstream change and may be part of the solution for easy, unobtrusive payment validation. With over a third of people finding that remembering multiple passwords is a challenge, people are already embracing fingerprint technology to access smartphones and laptops. The majority of people are comfortable with this stage of biometrics and agreed they would be happy to use their fingerprint to make a payment as well as to access an account. Despite some hesitation around using retinal scans and camera recognition – methods perhaps seen as more intrusive – 76% of people interviewed saw biometrics as the future of identity verification. Since personal interactions are generally harder to clone, this could be an important development in the fight against fraud. Automated checks offer both speed and security, whether the customer is making a purchase online or in person. When integrated with existing payment systems, simple extra checks help speed up the process of validating a customer and reduce the risk to them, as well as protecting your business from fraud. Doing this at point of sign up, before a payment is made, can stop fraud at the source, preventing payment delays. It also increases customer confidence in the company they’re purchasing from or setting up a Direct Debit with. Automated processes can enhance efficiency by checking multi-factors including the customer’s identity, but also that they are the holder of the bank account being used to make the payment. 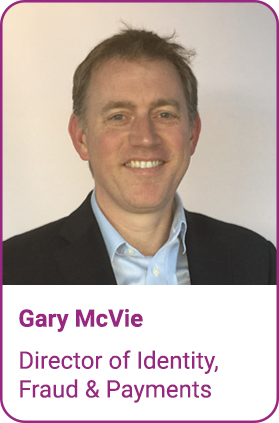 This adds another layer of protection against fraud, saving organisations the expense of paying indemnity claims and dealing with possible reputational damage. Bank account verification enables businesses to protect their cash flow, and in turn their forecasting of payments. Retailers have an additional benefit, in that they get to protect goods – such as mobile phones – against being fraudulently purchased and not recovered. Crucially, automated checks can also help bring you in line with the latest governance. Customers expect fast, efficient and timely transactions, and businesses need to adapt to meet this expectation across every channel. But building in extra anti- fraud measures needn’t be disruptive or inconvenient. In fact, it’s a win-win for both customers and organisations. However much the payment landscape changes, our need for swift reliable processes remains a constant. And as payments become easier to make, understanding identities and bank account ownership is more important than ever. Using agile payment solutions means you can meet customer needs and stay one step ahead of fraudsters.